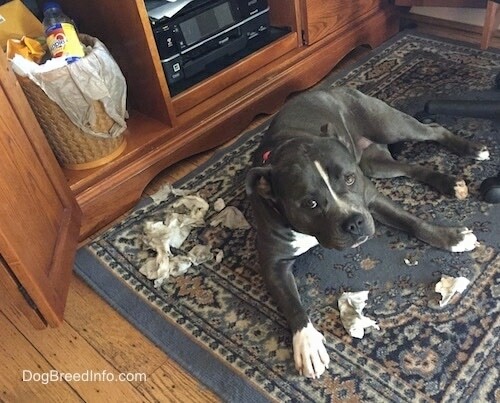 When I first walked in the room I thought Mia the blue-nose American Bully had puked, but I was actually relieved to see she had been in my trash can again. Mia, you're still bad! Don't give me those puppy eyes! 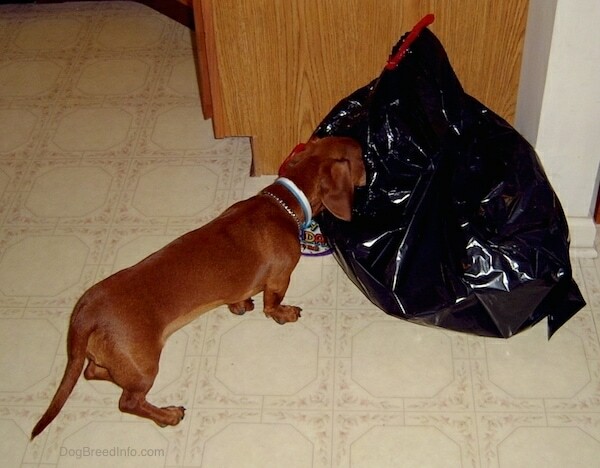 Dexter the Dachshund—Hey, get out of the trash! 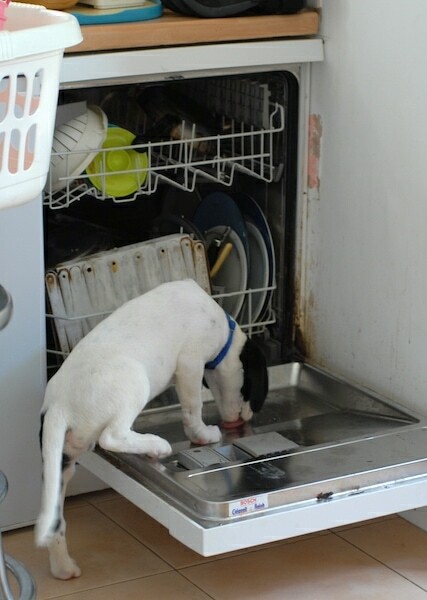 This is Jacca the Springador as a puppy at 12-weeks-old slurping his way through our washing up . Who can blame him, that mixture of food smells must be irresistible to a dog! The Springer Lab mix gives a fabulous, relaxed, trainable family dog but ohhhh... can he eat! Dogs wreaking havoc—"Recently my boyfriend and I got a second dog to keep Grendel, my Pointer company. We got an Australian Shepherd because with similar energy levels, they keep each other busy. Normally we take them to the park, out swimming, or for a walk every day. Today, however, I was desperate to get some work done in the house and put the two dogs in our securely fenced backyard for some playtime. They usually just wrestle and run around. They were out there for about an hour when it started to rain and I went to let them in, but when I opened the back door I was horrified to see that they had torn open three 30-lb bags of potting soil and strewn the destruction all over the concrete patio. Grendel the Pointer has some weird obsession with potting soil in particular and will dig in a freshly turned garden given the chance, but I wasn't expecting this! Boone (the Aussie), at 8 months old is always ready to follow any of Grendel's bad ideas!" "I've attached a picture of the two of them trying to run in past me through the door. It's hard to even tell that it's a concrete patio in that photo, but it is! It took me about an hour to shovel away the 90 pounds of soil and get the patio cleaned up. I love my dogs, but today I've certainly learned a lesson about leaving them to entertain themselves because they will, and it will probably be a form of entertainment that I do not approve of!" Rocky the Labradoodle at 6 months old, fast asleep after chewing the plant. "Rocky has a brother named Towie. Towie is a lover and Rocky loves to play. They are both littermate Labradoodle brothers. I came home a few times where they have read a magazine or newspaper, so I learned to keep paper products out of their reach. Once they even enjoyed my newly planted Lily of the Nile. 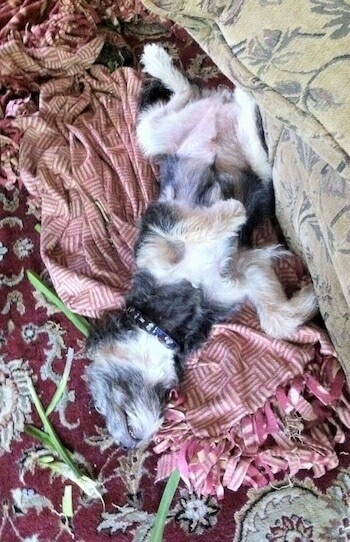 Rocky passed out by the evidence. I've learned to walk them more." 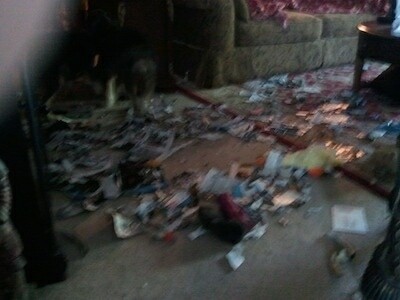 One of the messes that Labradoodles Towie and Rocky made! "The yellow dog is Buster. He is a mutt—a little bit of everything. He's such a sweet dog, you wouldn't think he could do anything wrong, but, HEY! THAT’S MY PURSE!" 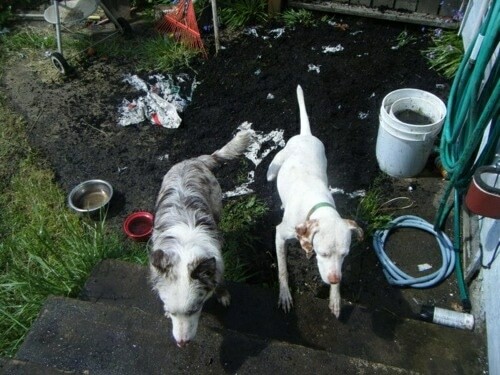 "The white dog is Zoey. She is a Springer Spaniel mix, very curious about everything. After I took that picture of Buster in my purse, I turned to put the camera down and what do I see? Zoey! That's MY SHOE!" "Benji my GSD. Height: 70 cm. (27.5 inches), weight: approx. 37 kg (81 pounds). I got Benji as a puppy from my brother’s friend. Since then I've loved him to bits.... Don't get me wrong, he's been quite a handful. When I finally got around to reading "Marley and Me" some parts seemed VERY familiar, if you know what I mean!!" "All the same, I couldn't ask for a better temperament: he loves kids, is protective over family when strangers walk up to us on walks, will sit by your side for hours, and has that gooey ‘I love you’ look on his face every time you give him a bone.... True, he does run after cats, hates magpies with a passion, doesn't understand the concept of snow, whips you with his tail, drools on all reachable surfaces, and would no sooner look at you then lick you to death but its these things that make him quirky!!" "His love of the world is fetch, and he will play for three hours straight if you let him (believe me I've seen firsthand), but his true talent is in the art of escape!!!" He began jumping over the garden wall to play with the neighbor’s dogs (they're childhood friends). This was funny at first but after he sprained his wrist it became serious.... First we nailed wooden planks to raise the height of the wall to 2 meters. Not a problem for Benjini! He simply climbed part of a tree, got onto our shed roof and climbed down to the neighbor’s shed roof and into the garden!! But that’s not all; we made the decision to tie him up for his own good—well, he broke through four sets of chains before we managed to get one strong enough!!" "Now he lives in the yard and meets his doggy friends when OUTSIDE walking!! Although, he still manages to free himself on the odd time...we have no idea how, but he manages it!!" "This is a picture of our German Shepherd / Collie mix named Pepper. I snapped this photo just after she had gotten done destroying a Mountain Dew cube—and weighing in at 80 lbs, that Mountain Dew cube didn't stand a chance. She wasn't always 80 lbs, though. When we got her from the local humane society, she weighed about 50 lbs. Since the Humane Society found her as a stray no one knows for sure exactly how old she is, but we're guessing she is no more than 3 or 4 years old because she has bounds of endless energy! We also are not 100% sure what breeds she is a mix of, but because she sports the traditional German Shepherd markings we know for sure she has at least some German Shepherd in her. Also because she has white markings and her snout is rather slender, we think she is almost certainly part Collie. (Although neither of those breeds have a curly tail, which she also has so she could also be part Husky). Pepper has a very passive/submissive personality and would rather go without her ball than pry it away from one of our other two dogs. She's quite the character; we often joke about how if she were a human she would always fuss about the violence in the world and then proclaim ’can't we all just get along? !’ I say that because whenever our other two dogs are roughhousing with each other, Pepper is right there refereeing the two by barking up a storm and whining as loud as she can until we stop them. She has a habit of climbing up on your lap, putting her head on your chest and staring at you until you give her attention! Pepper absolutely hates loud noises. She also hates it when our other dogs play. Although when we first got her she would steal food whenever she had the chance, Pepper has become a star with some basic obedience training and daily exercise! All in all, Pepper is very sweet and wonderful dog and I am very happy that she is part of my family."